A 51-year-old woman was admitted to our hospital with general fatigue, fever and cough. Upon examination, sinusitis, papules of the planta, polymorph leucocytosis, hypoalbuminaemia and an elevated level of PR3-antineutrophil cytoplasmic antibodies (ANCAs) were found. Her chest radiograph (figure 1A) and thoracic CT (figures 1B 2A) demonstrated a large area of consolidation with air bronchogram and cavitation in the right lung field. Specimens of biopsy from skin, lung and kidney showed necrotising granulomatous vasculitis. The patient was given a diagnosis of Wegener granulomatosis (WG) and treated with corticosteroid and cyclophosphamide. The consolidation resolved with residual scarring and was transformed into cystic lesions (figure 2B). Chest radiograph (A) and coronal view of thoracic CT (B) at initial presentation. Thoracic CT at initial presentation (A) and post-treatment (B). The lung is the most commonly involved organ in WG, and the most representative CT findings are multiple nodules, occasionally with cavitation. Areas of consolidation and ground-glass attenuation are also frequent findings, which represent granulomatous changes and pneumonia.1 In untreated disease, the lesions tend to increase in size and number, and sometimes progress with coalescence of adjacent opacities. The large consolidation observed in the present case may be explained by this mechanism, and cavities may represent necrosis or bronchiectasis. On treatment, the lesions disappear completely in the majority of cases, whereas occasionally they may regress with scarring constituted by linear opacities and bronchiectasis.2 The post-treatment extensive cystic change was also considered to be rare. WG may take a variety of forms, including a large area of consolidation. Physicians should consider WG in the differential diagnosis of consolidation. WG may regress with extensive cystic change.
. 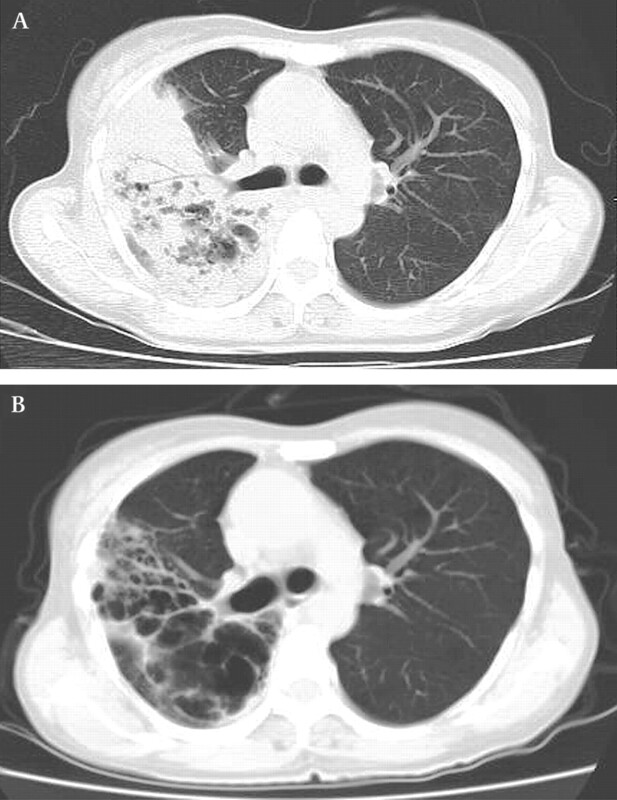 Pulmonary manifestations of Wegener granulomatosis: CT findings in 57 patients and a review of the literature. Eur J Radiol 2005;53:471–7.
. Pulmonary Wegener's granulomatosis: changes at follow-up CT. Eur Radiol 1998;8:1009–113. Correction notice This article has been corrected since it was published Online First. The title has been amended to ‘Granulomatosis with polyangitis (Wegener's)’.